Welcome to the Cinematic World of Batman! As a lover of this classic superhero, I've always felt he has strong literary themes. I am a fan of the Tim Burton films but prefer those of Christopher Nolan's. This website is the home for two of my film analyses: one for Batman Returns, and one for The Dark Knight. These were two I had something to say about. 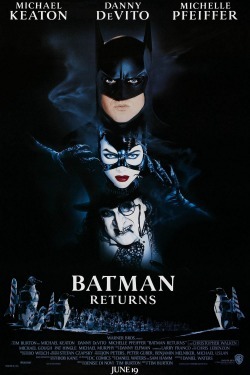 Batman Returns was one I had wanted to write an essay about for a while since there's a lot going on. I always thought it didn't quite work, but the potential was there. Once I finished that essay, I pretty much promised I would do another for The Dark Knight since it's my personal favorite and also had a lot to analyze. As for Tim Burton's first film (which I call Batman '89), along with Batman Forever and Batman and Robin, I honestly don't have much to say. They are all just basic action flicks, which got progressively worse. What about Batman Begins and The Dark Knight Rises? UPDATE: Since most people felt that this was needed, I finally broke down and wrote short editorials for both films. What about Batman: Mask of the Phantasm? I saw this for the first time recently. I liked it, but it struck me as a bit undeveloped. I thought it had the potential to have been stronger than it was. On the whole, though, still better than any of Joel Schumacher's films. These are summaries, not analyses! My style of analyzing is to go through the entire film, scene by scene, and go through the story and themes. Some people don't like this and feel it's too much summary. However, I personally feel it's the best way to cover every aspect of the film, and discuss each notable scene in the right context. It's also fun to write and fun to read. Keep in mind I write these more for myself and other fans, not for scholarly reasons. If you don't like my style, that's fine, but I think it's unfair to say nothing is being analyzed. How many times have you watched these movies? I've only seen Batman Returns in its entirety twice and that was enough to memorize the basic plot and order of scenes. It's a very straightforward narrative. While writing the piece, I had to go back and check out two or three different scenes. The Dark Knight was a lot harder due to its complicated plot and many parallel threads. I've seen it in its entirety three times, but also kept the screenplay readily available while writing, plus had to rewatch MANY scenes several times. It also didn't help that my computer crashed twice while I was writing the piece. Man, you must be a huge Batman fan! Yes and no. I've always had a basic attraction to the character and I like what he's capable of being with the right vision. I've only read a few of the comics, including the most notable "graphic novels" (a term I hate): The Dark Knight Returns, Year One, and The Long Halloween, and of course the one-shot The Killing Joke, which I loved. I'm a film person, so it's a little tough for me to get into the medium of comics. I've never seen a single episode of Batman: The Animated Series, which I know is supposed to be the greatest animated show in history, more or less. Hey, if it helped inspire Gargoyles, which is probably my all-time favorite animated series, then it's got my support. Have you done any other film analyses? Can we see them? The first one I ever did was back in high school on the film Stand By Me for a Psychology In Storytelling class. It was the first time I ever studied a film scene by scene. In college I did one on Eyes Wide Shut for Human Sexuality class. However, these were both so long ago and I don't think I even have the files anymore. I have hard copies, but I'm definitely not gonna retype them. Besides, they're both a little dull since the focus was more keeping it scholarly and less film analysis. I think I'm definitely through with Batman so I won't go in the direction. I have no definite plans for any other future analyses right now, but two that come to mind are my two favorite films of all time: Once Upon a Time In America and Fanny and Alexander.